Did you know the iPad keyboard can be moved around on the screen? Many iPad users may not be aware that the iPad onscreen keyboard can be relocated, either sliding it up or down on the display to whatever location works best for how they type and interact with the iPad keyboard. And yes the iPad keyboard can be moved around as a whole unit, without splitting the keyboard, though you can move the split keyboard to a new location if desired as well. 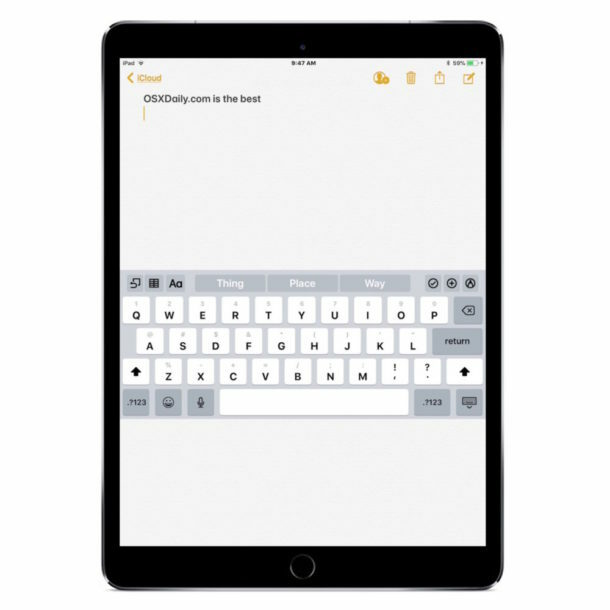 You can put the screen keyboard just about anywhere – up or down – on the iPad screen this way, though for most users it’s impractical to put the keyboard too high up on the iPad screen since it may obstruct visibility of what is being typed. Obviously this only applies to the on-screen iPad keyboard, as a physical keyboard would either need to be moved around on a desk or surface if it’s attached to the iPad in a case or Smart Keyboard, or if you’re using a detached external Bluetooth keyboard with iPad then you could just move that around as you wish maybe to create a simple standing desk for iPad or perform whatever other purpose you’d like. 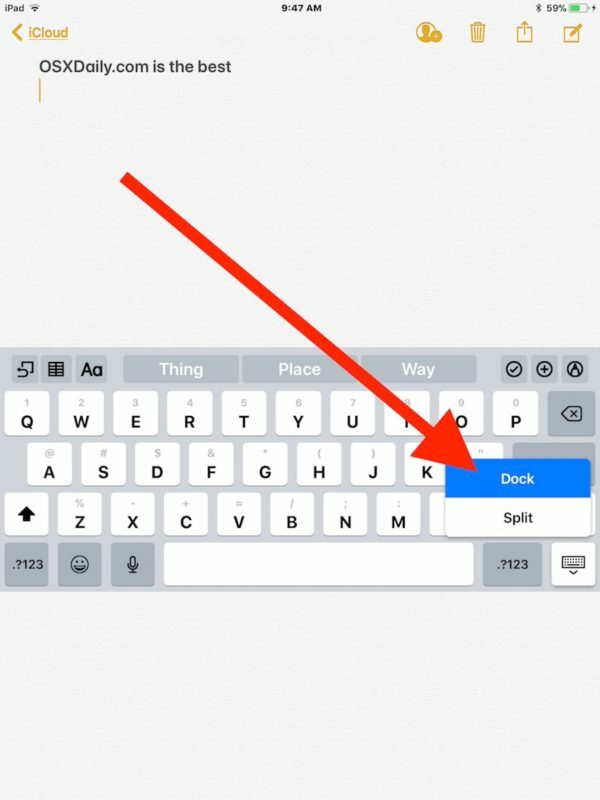 If you have never long-pressed that keyboard button on the iPad keyboard, you may not have known you can also split the iPad keyboard which makes it easier to type with thumbs for many users, and in some other typing situations. How do I dock the iPad keyboard and return to original screen location? Once you ‘dock’ the keyboard, it will return to the bottom of the screen as it is by default. Why is my iPad keyboard in the wrong place on screen? 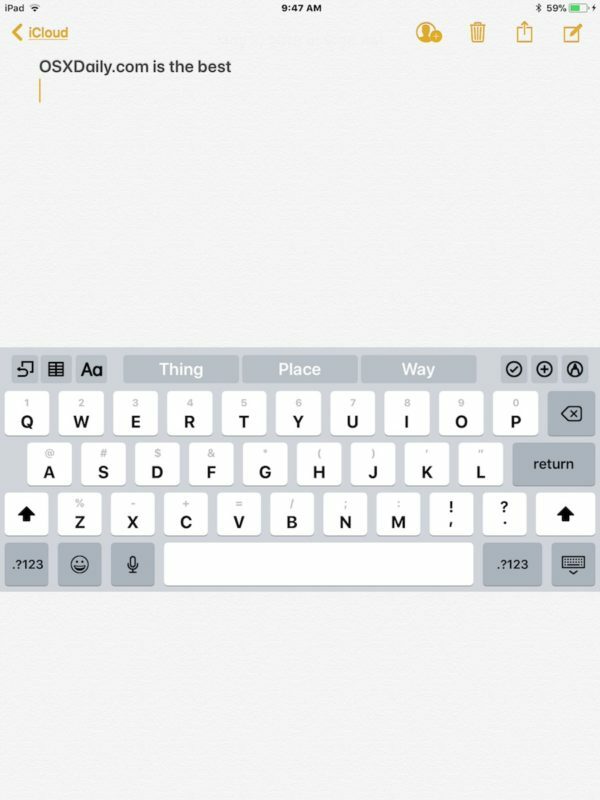 Some iPad users find that the iPad onscreen keyboard is located either too high or to a place they did not expect it to be. If you notice this, it’s probably because you undocked the iPad screen keyboard and moved it around, or someone else did. 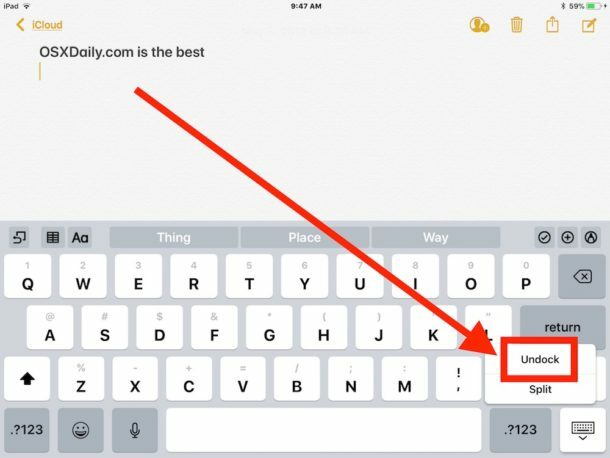 Rarely, a bug in iOS may cause the iPad keyboard to appear in a location it’s not supposed to, but those type of issues are quite rare and usually only occur in a particular app that hasn’t patched such a bug yet. Nonetheless, if you find the iPad keyboard is located somewhere strange, try the steps outlined further above to move the keyboard back to its original location. You may be thinking… this is great for iPad keyboards, but what about the iPhone? Can I move the iPhone keyboard around on the screen too? Not quite, but you can use the one-handed keyboard on iPhone which may be just as useful for some users. 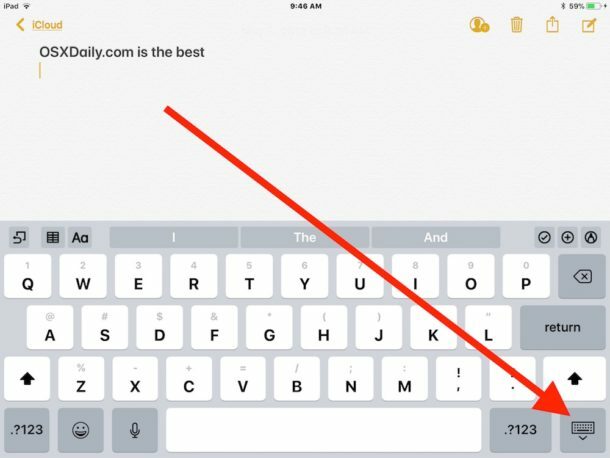 Do you know of any other interesting or fun keyboard tricks for iPad? Share them in the comments below! Doesn’t work on my ipad pro running the latest software. Does something need to be enabled somewhere? Then you will be able to dock/undock your keyboard. The Split Keyboard option needs to be turned on. Yes, this option isn’t available on the ipad pro it seems. Which is weird as it would certainly be a good idea. It does work on ipad pro. Just make sure you have Split Keyboard enabled, as suggested by MTK. The article should have mentioned this in the first place. It is available, just do as MTK says. Nope, not an option on a new (2017) 12″ ipad pro running the latest OS. Really. I’ve never seen this work on the iPad Pro although it does work on the non-Pro models. It doesn’t appear that this capability is coming to the iPad pro. It does work on the pro too, just go to settings>general>keyboard and turn on the switch for Split Keyboard. On the 10.5” pro, that is. Apparently not on the larger 12.9” model. Works on my iPad Pro 10.5 – somehow not every time though. Of note is that neither the G-Board nor Swype keyboards seem to support it. Selecting ‘Undock’ just pushes the keyboard about half way up the screen, but it’s not possible to drag it to position as required as described in the article. It sounds like an iOS / hardware dependent feature – especially in view of the comments about iPad Pro. It most certainly is available on the iPad Pro. I just tested it now. I didn’t know this could be done. So thank you, Paul, for the great tip. As stated by MTK above, it has to be turned on in settings – mine was by default. Fair point. Mine is an iPad Pro 10.5. Works fine on it. I just assumed that if it’s on earlier iPads and the 10.5 Pro; it would be on the other Pros too. Seems a bit ridiculous to exclude it on the other Pros when it’s apparently on earlier basic iPads. And by not enabling that, Apple also excluded the undocking ability from the 12.9” ipad pro. They must have thought that one was too large a screen to use a split keyboard. To get the Split Keyboard option on the iPad Pro, I think if you go to Settings->Display and Brightness>View>Zoomed, Tap on Set to switch your iPad Pro to Zoomed mode. It may restart. With that done, you can go to any App that requires a keyboard, and the Split option should then be available as shown in the article above. Is it still possible to enable screen zoom on iPad Pro? I thought Apple disabled that ability? Anyone confirm with iOS 11.3.1? I don’t think it is possible to enable screen zoom on new iPad Pro models, the feature used to exist but I understand it was removed from modern iOS versions. Screen zoom on iPad used to allow for split keyboard, from what I understand? I have the option on my 9.7″ iPad, but I do not have the 12″ model to test. “Turn Split Keyboard on or off. Touch and hold the Next Keyboard Emoji key or the Switch Keyboard key, slide to Keyboard settings, then select Split Keyboard. Or go to Settings > General > Keyboard, then turn Split Keyboard on or off. I do have it on the smaller ipad pro (10.5”), and I suppose that means the older 9.7” ipad pro would have it as well. Not sure about the 12.9” model though. Just double check to be sure: in settings>general>keyboard there should be a section labeled “all keyboards” with a bunch of switches in it, and one of them says “split keyboard”. If you have it, make sure it’s set to on. I can confirm no on the 12″ model as well. One of the reasons I never went with the larger model. The 12″ is the one that would benefit most from the split keyboard, and Apple blocks the option entirely for some reason!? “Turn Split Keyboard on or off. Touch and hold or , slide to Keyboard settings, then select Split Keyboard. Or go to Settings > General > Keyboard, then turn Split Keyboard on or off. Sorry, that excerpt says to touch and hold the Next Keyboard Emoji key or the Switch Keyboard key, but for some reason the respective icons weren’t pasted.